From driving water wheels to turning turbines, water has been used as the prime mover of machinery and the powerhouse of industry for many centuries. In ancient times, the forces of flowing water were even harnessed to power the first rudimentary clocks. Now, engineers at Stanford University have created the world’s first water-operated computer. 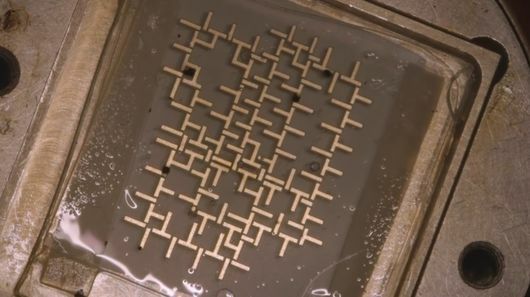 Using magnetized particles flowing through a micro-miniature network of channels, the machine runs like clockwork and is claimed to be capable of performing complex logical operations. Stanford's Manu Prakash created a computer clock made of water droplets trapped in a magnetic field that could have biological and chemical applications, as well as change the way scientists think about computation. Computers and water typically don't mix, but in Manu Prakash's lab, the two are one and the same. Prakash, an assistant professor of bioengineering at Stanford, and his students have built a synchronous computer that operates using the unique physics of moving water droplets. The results are published in the current edition of Nature Physics. "In this work, we finally demonstrate a synchronous, universal droplet logic and control," Prakash said. Because of its universal nature, the droplet computer can theoretically perform any operation that a conventional electronic computer can crunch, although at significantly slower rates. Prakash and his colleagues, however, have a more ambitious application in mind. The ability to precisely control droplets using fluidic computation could have a number of applications in high-throughput biology and chemistry, and possibly new applications in scalable digital manufacturing. "If you look back at big advances in society, computation takes a special place. We are trying to bring the same kind of exponential scale up because of computation we saw in the digital world into the physical world" Prakash said.